FrontDesk, Retail Therapy - Beverly Hills, Ca. 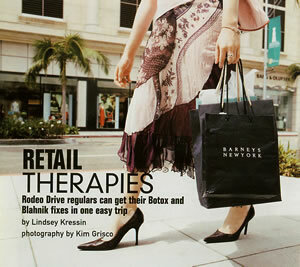 :: Rodeo Drive regulars can get their Botox and Blahnik fixes in one easy trip. It used to be getting a makeover meant a closet full of new clothes and a fresh new ‘do. 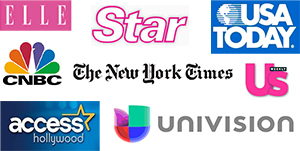 But somewhere between reality television and advancing technology, America’s obsession with self-improvement has rocketed into the stratosphere. Thanks to TV shows like The Swan and Extreme Makeover, more people are opting for a quick surgical fix — and plastic surgeons are responding by putting nipping and tucking within an exfoliated arm’s reach. Nowhere is the trend gaining more steam than in Beverly Hills, where a handful of doctors has set up medical shops among the fashion elite of Rodeo Drive. For prospective patients, the bonus is twofold: Not only do they get to skip the dreary hospital scene; medical care has never been more convenient. Welcome to the age of retail medicine, where getting a facelift is almost as easy as picking up a pair of Prada pumps. 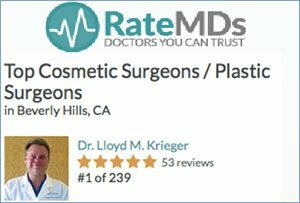 It started about 18 months ago when Rodeo Drive Plastic Surgery(421 N. Rodeo Dr., Terrace Level South, 310.550.6300) — a ritzy nip-and-tuck stop favored by moms in search of their pre-pregnancy abs — opened not far from Chanel. Never mind that Rodeo doctors pay more per square foot than they would in other parts of town; they’re banking on the tony address to win new clients. And it’s paying off. 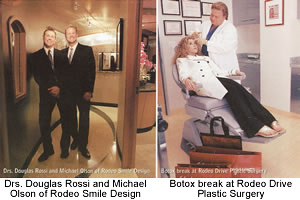 Ever since doctors Michael Olson and Douglas Rossi set up their cosmetic dentistry office, Rodeo Smile Design (421 N. Rodeo Dr., Ste. G12, 310.278.8558), in the quiet courtyard of shops known as , business has been booming. After just a year, walk-ins account for nearly 20 percent of the dentists’ business. “The exclusivity of Rodeo Drive gives patients the peace of mind that you’re offering the best,” says Olson. And in today’s hot cosmetic surgery climate, exclusivity is what it’s all about. To that end, Rossi and Olson created a tranquil, watery oasis where creature comforts like massage chairs, paraffin hand dips and aromatherapy are part of any dental procedure. Upstairs at ORA Dentistry Spa (421 N. Rodeo Dr., Penthouse Level, 310.273.0848), a Zen-styled penthouse with a fashionista’s eye view of Ralph Lauren, living up to the posh address means pampering clients to the max. Putting a New Age spin on old-fashioned dentistry, ORA, which opened last fall, offers a menu full of spa-oriented amenities. In addition to high-tech dental services, there’s a tonic bar, free-radical-blasting facials and a spiritual healer who helps take the dread out of the dentist’s chair with energy-infused massages. An elevator ride away at the year-and-a-half-old Medical Hair Restoration (421 N. Rodeo Dr., Ste. T7, 310.860.0606), clients can watch DVDs while the doctor weaves his magic, then head home (in six hours or less) with a designer bandana to hide the evidence.